Great Small House Ideas Auckland. Parnell. Hulme Court. The oldest surviving house in Auckland. Built in 1843 for Sir Frederick Whitaker who much later became Prime Minister of New Zealand. Bishopscourt and the Anglican precinct at Parnell. This small area of Parnell contains the Anglican Bishopscourt – the Bishop’s Palace- the Bishop’s Library, the Dean’s Rectory, the modern Anglican cathedral and the old wooden cathedral. The first and only Bishop of New Zealand (other NZ cities had Anglican bishops by the time he left), Bishop George Selwyn ( served 1841 to 1868) chose a church at Parnell for the headquarters of his bishopric. He purchased land here in 1843 and built St Barnabas wooden Anglican in 1849 as a parish church. St Barnabas Church was removed to Mt Eden after the first wooden St Mary’s Church opened in 1860. Old St Mary’s church was relegated to a secondary place when the foundation stone of a new grand wooden cathedral was laid in 1886. The architect of what was then the largest wooden church in the world was Benjamin Mountford. He had intended his design to be built in stone but the costs were too high so wood was used instead. St Mary’s Cathedral was opened and consecrated in 1888 but was not completed until 1898 with the features and size of a grand medieval Gothic cathedral. Its stained glass windows are superb. The wooden St Mary’s Cathedral was the cathedral of Auckland until 1973 when the new stone Holy Trinity Cathedral replaced it. The foundation stone of the new cathedral was laid in 1957 but it was not fully completed until 2016 and it was finally consecrated in October 2017. The main nave was completed in 1995. In 1982 the old 1898 wooden St Mary’s Cathedral was moved across the road to be sited next to the new Holy Trinity cathedral. Nearby are some superb Anglican historical buildings. Bishopscourt, the palatial home and chapel of Bishop George Selwyn was built in 1863. It has fine gardens which originally spread over four acres. Next to the house is the Selwyn Library also completed in wooden Gothic style. The octagonal tower was added to the library in 1862. Many of the theological books in it were presented by Bishop Selwyn with many being in Greek and Latin. It was finished in 1861 before Bishopscourt which perhaps indicated the importance Bishop Selwyn placed on his cathedral library. Around the corner in St Stephen’s Avenue is the former Anglican Deanery. 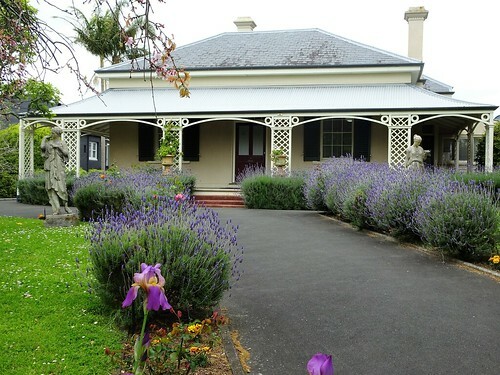 The Deanery was built in black basalt stone and completed in 1857 when Bishop Selwyn moved into it before Bishopscourt was completed in 1863.The Deanery was designed by architect Frederick Thatcher. Bishop Selwyn had several stone houses built in Parnell in the 1850s by stone mason Benjamin Strange. One down the hill at 4 Takutai Street was built 1858 and later lived in by the Archdeacon of St Mary’s Church. The other is the Kinder House at 2 Ayr Street built from 1856 for the headmaster of the Church of England Grammar School who was John Kinder. Like the Deanery this basalt two storey house was designed by Frederick Thatcher. The basalt for Kinder House and the Deanery came from the volcanic cone of Mt Eden.